Already our 30Nm crossing from Martinique was as varied and dramatic as our new host. We had everything from calm mist to stormy rain in 40knots. We have indeed come a long way. 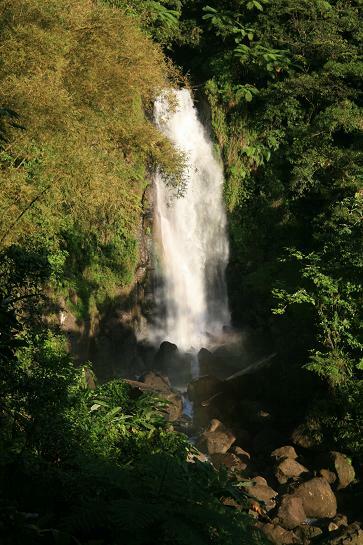 Dominica has blown us away...by its natural and unspoiled beauty and sometimes the gusts which comes down from the high mountains, oddly on a clear day. 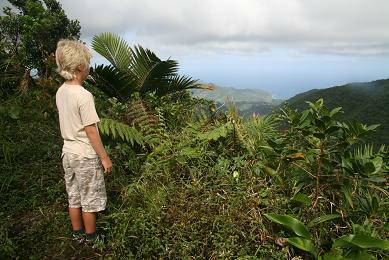 We came for a couple of days curious of this less developed island that is ahead on ecotourism. We have stayed a week and surely we will be back to the island of liquid sunshine - when light rain comes with the wind on a sunny day. Christopher Columbus discovered the island on Sunday or Domingo already in Nov 1493. In some ways it may be good that yachts and tourist still pass the island by. For the Although we worry seeing up to three cruise ships on one day. 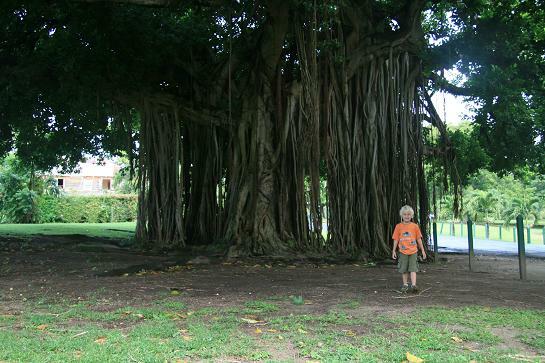 The capital Roseau is different than your normal Caribbean island ..poor, no beaches, but all the more friendly people. 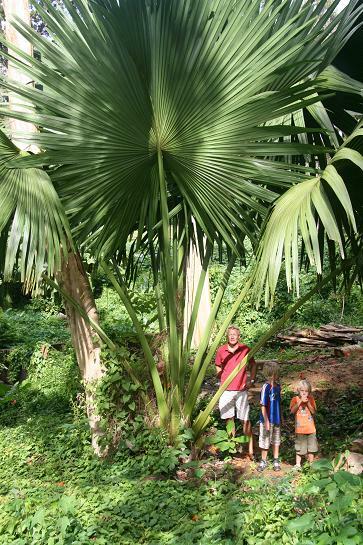 The Carib Indians has named the island Kubuli for the tallness of its many mountains. They attract clouds which again brings rain, rivers and over 30 water falls. Trafalgar Falls could almost compete with Voringsfossen. 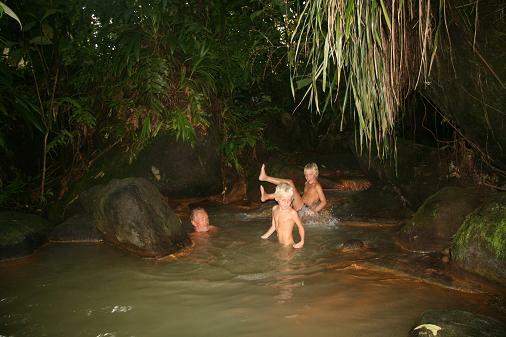 After a landslide the warm stream now comes up of the stones below: unbeatable after an afternoon of exploring. 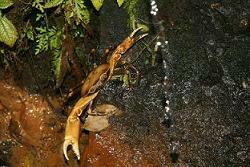 Who cares having just seen a big freshwater crab on the trail before these natural pools. 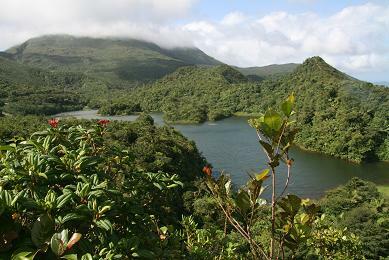 The greenery and rich rainforest stretch everywhere with lots of trails to chose from.These are well prepared and mapped, interestingly by EU funds (as Dominica has Commonwealth benefits). We think also since the island can not offer much beaches to attract. Our sailing legs needed some real hiking, and the boys obviously more so! They have been running and climbing between big trees we at home only see small in pots in our windows. Einar's school project has been the rain forest. The 'jungle' gave him almost magical sights and sounds .... birds songs, frogs, hawks, colibri and small streams between gum trees, hibiscus, ficus, palm trees, lianer and at the very top golden light through the tree tops .Some hikes take you to unusual phenomena like boiling lake, sulfur springs or volcanic crater lakes like the Fresh waterlake. Einar virtually ran around it - up and down to the many peaks, see trail on right. The Atlantic is also out there. This lake and its falls provides water and electricity for the island. It also passes through Ti Tu Gorge. A small canyon where you can just about swim in between tall boulders of dark wet stone for a 100 meters into a powerful waterfall. An unforgettable thrill swimming into the crystal clear twenty degree water in almost darkness as the sun barely comes through the tree tops in the the few meters wide opening above you. This is were Jack Sparrow swam for his life in Pirates of the Caribbean. The cannibal village of the film was just where we came into the island. Sea Cat (Octavius) made our trips special. 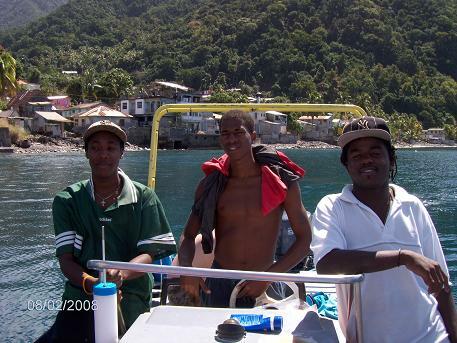 He has placed some moorings in the bay and has personally been the key to welcoming yachting tourism to Dominica. He is a bundle of energy and everybody knows him whether in the villages or far out in the forests. 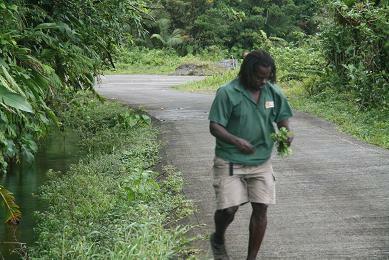 He runs out of his car to bring us the treasures of the island...guave,.cinnamon, breadfruit, lemon grass, mango, grapefruit, tangerines, coffee beans, chocolate....A lot grows wild also after hurricane David destroyed citrus and banana plantations. 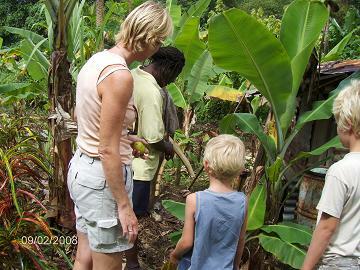 Banana has been 'green gold' for the people and the loss has been hard on the island. Up in the Layou valley we met Sea Cat's grand uncle who was making coal. He comes up to his family's old land to harvest old plantation land. Sugar cane with lime was a fresh treat and just like a brushing your teeth! Sea Cat picking water cress in a stream fro our salad. Cutting sugar cane. We finally have met Caribs! These Indian's originally came from South America, but was largely eradicated by the English and French colonist on most islands. On Dominica, a large population survived and today they live in the Carib territory, though rather isolated and subject to different 'rules'. They live off their land and as their ancestors are excellent craftsmen. We ate Cassawa bread which Manuel made by the roadside. A weekend tradition and there was a long line for this traditional bread from arrowroot. 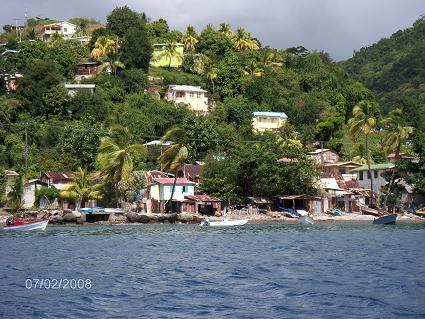 Dominica is also spectacular under water. Just recently voted one of the best dive sites in the Caribbean. Elin and Kristoffer got a taste of this taking the PADI open water course. At Alldive, Billy and is wife Samantha is starting out their promising business and like many others seeing the potential of Dominica. We are sure they will succeed with their service and genuine interest in making a difference! The teens were told they are brilliant water people and came back from their last dive in caves and had swam with both turtle the size of Einar and stingray. Maybe growing up at the Red Sea on weekends is still in their veins! Magnus has also done his first long snorkle trip to champagne bubbles or actually sulfur bubbles coming out under water. He thought the school of yellow sergant fish was much more fun - and the dive boys. They have been 'helped' off the street by Billy who now is giving them a chance of a dive instructor occupation. 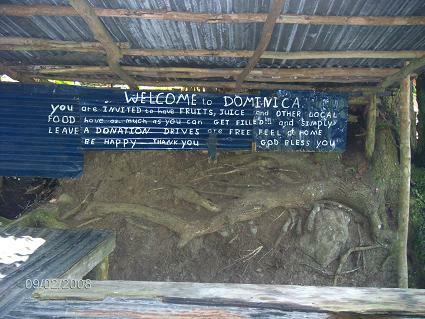 Dominica's future will be interesting to follow. May hurricanes and politics keep it on a good path. Last week's announcement of its prime minster about to make deals with Chavez of Venezuela for oil raffinery and a union of sorts does not fit with the image and potential Dominica and its people has. We will spend a night in Portsmouth before we set sail for Iles des Saintes south of Guadeloupe.